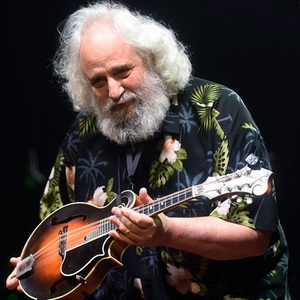 David Grisman (born 1945 in Hackensack, New Jersey) is a noted bluegrass/newgrass mandolinist and composer of acoustic music. He started the Acoustic Disc record label in an effort to preserve and spread acoustic or instrumental music. David Grisman started his musical career in 1963 as a member of The Even Dozen Jug Band. His nickname, "Dawg" was affectionately assigned by his close friend Jerry Garcia (the two met at a Van Hoy Campground (NC) back when they used to host the old time fiddlers convention). David Grisman started his musical career in 1963 as a member of The Even Dozen Jug Band. His nickname, "Dawg" was affectionately assigned by his close friend Jerry Garcia (the two met at a Van Hoy Campground (NC) back when they used to host the old time fiddlers convention). "Dawg Music" is what he calls his mixture of bluegrass and Django Reinhardt-St?phane Grappelli-influenced jazz, as highlighted on his 1977 album "Hot Dawg". Stephane Grappelli played on a couple of tracks on the Hot Dawg album and then the 1981 recording "Stephane Grappelli and David Grisman Live". It was his early fusions with Reinhardt-era Jazz that led to the formation of the genre known as newgrass. Grisman, along with New Grass Revival are generally considered the modern day Bill Monroes to this new bluegrass-influenced sound. Denny Zeitlin, Tony Rice, Mark O'Connor, B?la Fleck, Bob Brozman, Mike Auldridge, Mike Seeger, David Bromberg, Martin Taylor, Del McCoury, Ralph Stanley, Earl Scruggs, John Hartford, Darol Anger (Turtle Island String Quartet), Sam Bush, and the Kronos Quartet are just some of the musicians that have played with David Grisman or been part of the DGQ (David Grisman Quintet). The documentary "Grateful Dawg" chronicles the deep friendship between Jerry Garcia and David Grisman. David Grisman appeared on the Grateful Dead's American Beauty album. To this day, Grisman complains of how Jerry Garcia vetoed the length of the mandolin solo featured on the studio version of Ripple. The two recorded a number of duet albums, including the children's album "Not for Kids Only". They also played together as the band "Old and in the Way" with Vassar Clements, Peter Rowan, and John Kahn, which recorded three different albums.